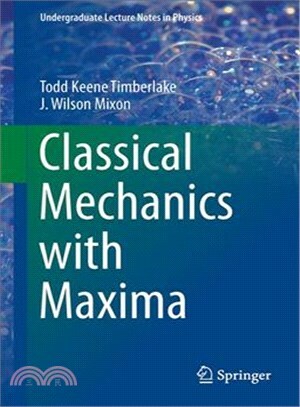 This book guides undergraduate students in the use of Maxima—a computer algebra system—in solving problems in classical mechanics. It functions well as a supplement to a typical classical mechanics textbook. When it comes to problems that are too difficult to solve by hand, computer algebra systems that can perform symbolic mathematical manipulations are a valuable tool.Maxima is particularly attractive in that it is open-source, multiple-platform software that students can download and install free of charge. Lessons learned and capabilities developed usingMaxima are easily transferred to other, proprietary software. J. Wilson Mixon is Dana Professor of Economics Emeritus at Berry college. Over 70 of his articles have appeared in refereed economics journals. They continue to be downloaded in significant numbers. He maintains a web site that contains a large amount ofExcel-based analysis of economic principles. In the past three years, over 27,000 have visited the site.